Bill Cosby could be sentenced to 30 years in prison. But it's likely to be much less. "The big battle is whether in fact he gets jail time,” a former federal prosecutor said. Bill Cosby's accusers cheered outside the Norristown, Pennsylvania, courthouse on Thursday when they learned he had been convicted on three counts of aggravated indecent assault and could face as much as 30 years in prison — but the amount of jail time he will actually see is an outstanding question. 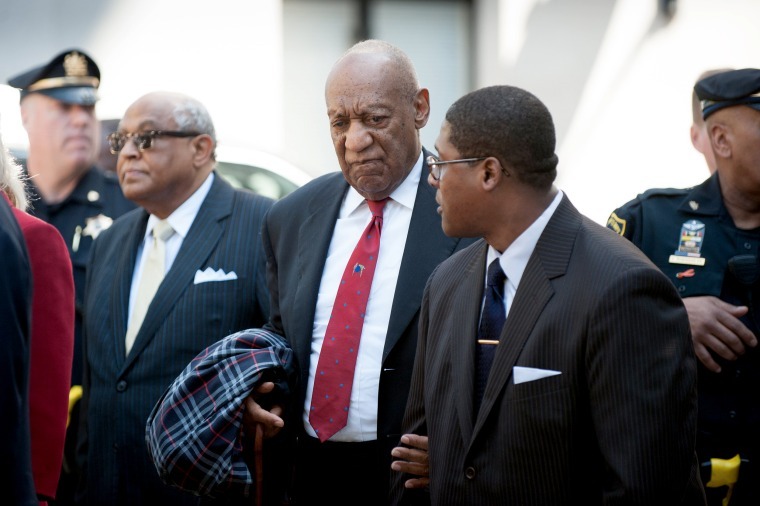 The maximum sentence for each of the three counts is 10 years, or 30 years in total, meaning the 80-year-old Cosby, who is legally blind and in poor health, could spend the end of his life in prison. (He is currently out on bail and confined to his home while awaiting sentencing.) But legal experts say the maximum sentences are not typically what a defendant will get in Pennsylvania. "The maximums are very deceptive about what the real sentence is going to be," said Michael DiCindio, a criminal defense attorney who practices in Montgomery County, where Cosby was convicted. DiCindio said that while there are maximums in the state that could be imposed, Pennsylvania's sentencing guidelines are "going to weigh heavily in balance." In 1982, the Pennsylvania Commission on Sentencing created benchmarks to promote "equity and fairness" in sentencing. The sentencing guidelines for aggravated indecent assault call for 22 to 36 months for each count, rather than the 10-year maximum. Judges have discretion to consider a variety of factors in determining a sentence, including a defendant's criminal history, the effect of the criminal behavior on public safety and the possibility of mitigating and aggravating factors in the case. Based on those factors, judges decide the length of the sentence on each count, as well as whether those sentences are served consecutively or concurrently. Defendants are typically assigned a sentencing hearing 60 to 90 days after a conviction. At the sentencing hearing, attorneys for both sides will argue for the aggravating and mitigating circumstances in the case. "I would think the big battle is whether in fact he gets jail time," said Jack Meyerson, a former federal prosecutor and Philadelphia-based attorney. "Given the public scrutiny over the case and Cosby’s celebrity," Meyerson continued, "the judge may feel pressured to send Cosby to prison. Given the circumstances of the case, and public attention, I think he would have to send a message with some jail time." Cosby has been accused by dozens of women of misbehavior ranging from sexual harassment to assault, but in nearly all of the cases, the statute of limitations had already passed by the time the allegations surfaced. That was not the case for Andrea Constand, a former Temple University employee, who testified that Cosby had drugged and sexually assaulted her in 2004. The three counts Cosby was convicted of on Thursday stem from that encounter. At Cosby's sentencing hearing, prosecutors will likely argue for a higher sentence based on Cosby's use of intoxicants in Constand's assault, as well as the number of alleged incidents involving other women. On the other hand, Cosby’s defense attorneys may argue that, based on his age and poor health, as well as the significant charitable contributions he has made and his lack of a previous criminal record, he should not have to serve jail time. As in the Larry Nassar case, in which more than 150 women testified at a sentencing hearing for the former Michigan State doctor accused of molesting young gymnasts, the judge could allow Cosby’s dozens of accusers to testify in open court. Cosby's attorneys said they would appeal the conviction. Meyerson said it's possible the attorneys would ask the judge to allow Cosby to remain on bail, rather than imprisoned, pending that appeal. If the judge denies that request, his attorneys could appeal that decision to a higher court.